Lovely young heiress Sunny Landers was utterly devoted to her father's great dream --- a transcontinental railroad that would run from Chicago across the Great Plains to the Pacific. Accompanying Bo Landers on a wagon train west, she discovered for herself the glories of the unsettled country --- and met the rugged frontiersman who would be her destiny. Half Cherokee but raised by whites, Colt Travis was like the land of his birth: handsome to gaze upon, yet wild, imposing, dangerous. When he first saw the spirited, passionate daughter of Bo Landers, the man who'd hired him to scout the western territories, he knew she was everything he'd ever wanted in a woman --- but believed he never could have. Beneath a starlit sky, against an endless horizon, Colt opened Sunny's eyes to the majestic beauty of the land, then awakened her body and soul to an ecstasy she'd never dreamed possible. Together they would fight to settle an untamed country, uniting a nation that war had shattered --- but could they brave the perils that threatened to drive them apart? Sunny held her chin higher and faced him. “I’ll race you,” she told him. She gave him a daring look, a new boldness in her eyes. “I said I’ll race you. If you catch me and manage to pull me off my horse, you’ve won!” She charged away, and Colt sat there a minute, wondering what she was up to. What was this sudden change in conversation? She was like a crazy woman today, and she had turned his feelings a thousand different ways. Colt watched her, the way her bottom fit her saddle, the way her hair blew in the wind. Her daring look stirred his pride, and the race was on. He kicked Dancer into a hard run, manly desires stirring in him at the challenge of catching her. He held the reins with one hand and smashed out his cigarette against his saddle horn with the other, tossing the stub aside and leaning into the ride. “Get up there, Dancer,” he shouted to the horse. Dancer’s mane flew up into Colt’s face as he galloped up and down more sandhills. He noticed Sunny veer to the west rather than north, and he turned Dancer, taking a cut between two more sandhills and emerging near Sunny as she came around the end of one hill. She screamed and laughed when she saw him, and now he knew he could catch her. He came closer, the determination to reach her now a burning need. It went against all reason, was totally foreign to all sense of maturity. They were like children for the moment, and yet not children at all. The emotions it stirred in him to think of catching her were dangerous, yet he could not stop himself. He came ever closer, and now he was on her! Sunny screamed when she felt his strong arm come around her. Suddenly, she was free of her horse and sitting sideways on Dancer, a powerful arm holding her. She covered her face and laughed as Colt slowed his horse. “Now you are my captive,” he teased. She threw her head back and faced him, and both of them sobered. For a moment they sat there breathing heavily from the ride, watching each other. “We had better go catch your horse,” he finally told her. For a moment everything went silent for him. Nothing existed but the utterly beautiful woman in his arms, her tempting mouth, her open blouse, her blue eyes, her golden hair. He moved a hand to rest against the flat of her belly. “He takes her to his tipi and makes her his slave,” he answered, his voice gruff with passion. His kiss cut off her words, a deep, hot kiss that removed any remaining inhibitions. She could barely get her breath for the thrill of it, the ecstasy of his hand moving to her breast, the ache of womanly desires that surged in her when his tongue moved between her lips. Dancer moved slightly, and she clung to Colt. He left her lips for a moment, keeping one arm around her as he slid off the horse and pulled her after him. I enjoyed not only the time period of the novel, but also the time span. Bittner writes about the lives of her characters, not simply a snippet into it. Years passed without me feeling I was missing anything or if time was running away from me. It also means that the relationship between the main characters was not, in any sense, rushed. The low key, rolling style of the tale was perfectly suited to the story at hand, heightening and highlighting certain events throughout. The characters that Bittner creates truly enhance the tale. The sense of impossibility yet necessity between them was unforgettable. Not only were they fantastic individuals in and of themselves, but they were so periodically correct, adding to the flair of the novel. I wanted to get to know these individuals on so many levels. I found myself rooting for them throughout and loving the journey that they took me on. 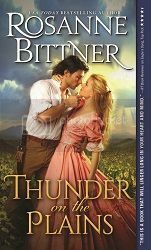 Bittner writes epic romance in the truest sense. She weaves magic through the pages as she takes readers back in time on a remarkable journey. Be sure to enter the tour wide giveaway!